I can’t believe I’m actually going to let my wife drag me to another Black Friday tomorrow. We’ve done it for several years in a row, and I tell myself to “just say no” the next year, but I never do. Now that I’ve risen early in the wee hours of the morning, fought the crowds, and have the scars to prove it, I guess I’m a Black Friday veteran. 1. The early bird gets the worm…arrive early! You’ve seen the pictures of people camping out in front of retailers to get a special bargain price on something that’s advertised, right? This year a national retailer is promoting the Black Friday pricing of a 42″ flat screen television at $199, and people are already camping out on the sidewalks! In Sunday School ministry, the same rule applies…arrive early if you want to get a jump on the day. Set up your classroom, pray over the empty seats with a view to the people who will soon arrive for class, and review your teaching outline one final time. Never let members or guests beat you there. Get up and get going on Sunday morning! 2. You are doing it for others. Almost everyone who is out shopping at 4:00 A.M. is doing it because they have a special gift they are trying to find for someone else. As a shopper, it makes me smile when I grab a special gift for my wife, sons, or other family member or friend before it disappears from the shelf. Sunday School teachers and leaders need to remember that they teach and lead not for themselves, but for others. God is using their spiritual gifts to bless others and to strengthen His church. If you are a teacher/leader, never forget that the ministry of teaching to which you’ve been called is for God’s glory, not your own. It’s not about you…it is about others. You do what you do for Him and for them. 3. You need a strategy. When my wife and I go shopping during the early morning hours this Friday, you can bet that we (really she) has a plan of attack. She will have a system for which stores we will visit first; they will be in proximity to each other, and in a descending order of importance based on the gifts she is looking for. Sunday School is no different! Teachers and leaders need a plan of attack, too. Decisions must be made about the strategy behind the types of adult classes you will offer (by age, generation, lifestyle/life stage, special interest, or materials being studied). Leaders must also strategize how to attack the work of the class…there are important tasks to be done like inreach, outreach, prayer, and fellowships; someone has to see that these are accomplished, and it must not all fall on the teacher to do.. Classes also must have a strategy for starting new classes – this is one of the most important things a class should do, but one for which most classes lack a clear strategy. 4. Crowds attract crowds. It’s amazing, but some of the retailers we will visit on Black Friday will be so packed with shoppers that you can hardly get up and down the isles. The parking lots are full of cars, and there is a vibrancy that other retailers often do not enjoy. My wife and I are amazed each year at the fact that some retailers seem to get all the people, while others are open for business yet don’t have customers! Let’s think about Sunday School: if you have a small class, it can be too small and anemic to attract new people. Have you ever noticed that you don’t usually eat at restaurants where there are no crowds? There’s a reason for that! Crowds say something to us…namely that the products or services offered by a retailer are excellent and have value. People often look for a Sunday School class that has life and vibrancy, so if your class is too small and the crowds just aren’t there, consider combining with another class that is similar to yours. Remember that crowds attract crowds. In Sunday School this is a tough balancing act…we want classes that are small enough for people to build relationships, but not so small that there is a lack of energy, vitality, and life. 5. Do your research. I can guarantee that in the heat of battle on Friday morning, there is no time for doing on-the-spot research about products -things simply move much too fast. The time for that is before we leave the house for Black Friday shopping. My wife and I will know exactly what brands and kinds of items we want…and don’t want…because we’ve done our research. As a Sunday School teacher, the research you conduct for teaching your lesson must take place well before you get to the classroom. One reason I’m such a big fan of LifeWay’s ongoing Sunday School curriculum is that there is great commentary in the Leader Guide, but there are advanced commentaries and other teaching supplements that really load up a teacher with great teaching helps. All of the research a teacher could possibly want to do could be done with the great resources that can be purchased (at minimal prices) from LifeWay. 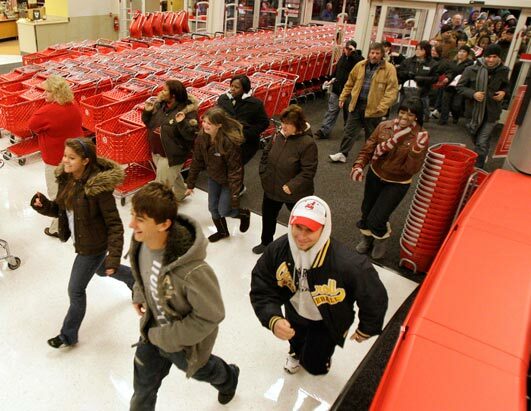 There you have it…5 quick things that Black Friday can teach Sunday School. I hope that your Thanksgiving is a good one, and that you’ll enjoy doing battle with me and others who venture out on Black Friday. Previous Want a little “Extra!” something for your Sunday School lesson?